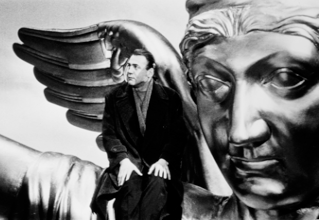 In Wim Wenders's iconic Berlin film "Wings of Desire," two invisible angels (played by Bruno Ganz and Otto Sander) watch and listen in on the city's diverse population. Wandering through the city, they encounter many different people and their intimate thoughts and feelings. Wings of Desire is an audio-visual tour de force of immense poetic power, with the ever-present Berlin Wall as an icon of grief.